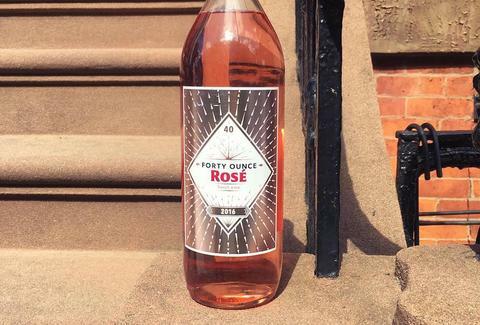 Summer is just around the corner, which more importantly means we're on the cusp of rosé season. And this year's is on track to be a doozy, thanks to some intrepid winemakers who've made the brilliant decision to package their pink nectar of the park picnic and pool party gods in a forty. Eat your heart out, Colt 45. While Forty Ounce Wine's packaging may have you thinking it's some bottom-shelf hooch, don't be fooled. The rosé -- as well as the company's similarly packaged muscadet -- is produced by an organic winemaker in the Loire Valley, and is evidently pretty tasty. And besides the novelty of the bottle, the fact that it's 40 ounces means you're getting nearly double the rosé you would in a 750ml bottle. So far, the bottles have been spotted at select liquor stores in New York City for $16 a pop, and are also available in Pennsylvania, New Jersey, California, and Colorado. Though according to Delish, the company only produced 1,200 cases for the season, so you better hustle if you want to get in on the action. BYO brown paper bag. Joe McGauley is a senior writer for Thrillist, and fully supports Rosé All Day.